[192 Pages Report] The agricultural microbials market was valued at USD 2.74 Billion in 2016, and is projected to reach USD 6.01 Billion by 2022, at a CAGR of 14.21% during the forecast period. Secondary research was conducted to obtain the value of agricultural microbials market for regions such as North America, Europe, Asia Pacific, South America, and RoW. The key players were identified through secondary sources such as the Bloomberg, Businessweek, Factiva, agricultural magazines and companies’ annual reports, while their market shares in the respective regions were determined through both, primary and secondary research. 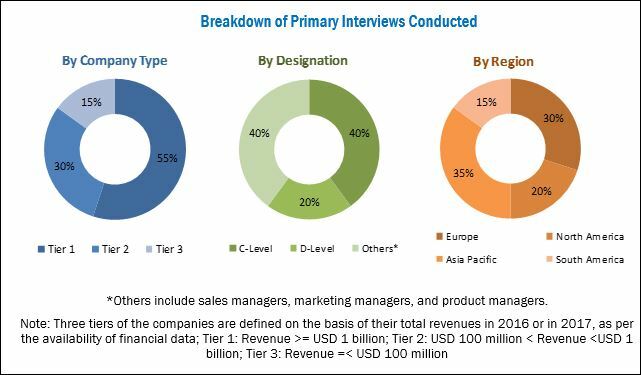 The research methodology includes the study of annual and financial reports of top market players, as well as interviews with industry experts (such as CEOs, VPs, directors, and marketing executives) for key insights (both quantitative and qualitative) for this market. The various contributors involved in the value chain of the agricultural microbials market include raw material suppliers, R&D institutes, agricultural microbials manufacturing companies such as BASF (Germany), Bayer (Germany), Monsanto BioAg (US), BioWorks (US), and Certis (US) and government bodies & regulatory associations such as the US Department of Agriculture (USDA). This research report categorizes the global market based on type, function, crop type, mode of application, formulation, and region. 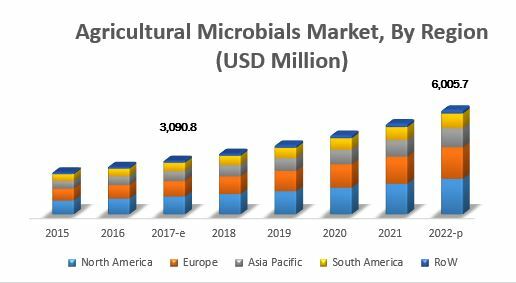 The agricultural microbials market is estimated at USD 3.09 Billion in 2017, and is projected to reach USD 6.01 Billion by 2022, at a CAGR of 14.21%. The agricultural and environmental benefits associated with these microbial solutions are the major factors contributing to the growth of this market, globally. In comparison to their chemical counterparts, microbial solutions are very target-specific. Crop protection is the major function targeted by agricultural input companies. Owing to the increasing ban on chemical pesticides in major countries, there is an immense scope and an increasing demand for the development of agricultural microbials. 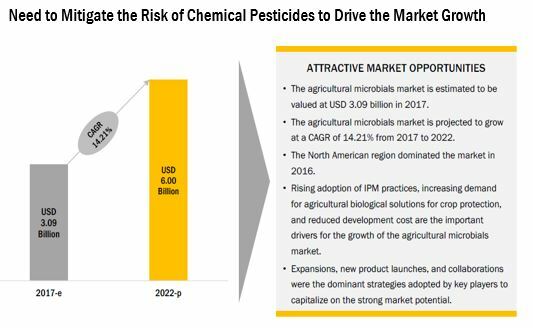 The reduced development cost and time associated with microbial pesticides, reduction in the availability of chemical or synthetic active ingredients, and increase in pest resistance to several chemical pesticides is pushing the market growth toward microbial crop protection. The agricultural microbials market, based on type, has been segmented into bacteria, fungi, virus, and protozoa. The application of bacteria in agriculture has increased in terms of biofertilizers and biopesticides, as these provide higher and healthy yields in a sustainable manner. Bacterial strains are easily available in the surrounding environment and can be isolated and reproduced. The application of bacterial strains in agriculture is expected to increase with the entry of agrochemical players and a rise in the number of product launches. Fruits & vegetables are mostly eaten without industrial processing; the concerns regarding pesticide residue is higher in such crops as compared to that in other crop types that are not consumed in their raw form. Thus, agricultural microbials are most prominently used in the production of fruits & vegetables. Thus, the market for the use of agricultural microbials in fruit & vegetable cultivation is estimated to dominate the global market in 2017. Microbials can be applied in a number of ways, of which foliar spray is the most widely accepted application mode across the globe. However, precision targeting and application advantages associated with seed treatment have been gaining importance in recent times for microbials across the globe. Controlled-release is another technology being explored by research institutions and key players to enhance integrated pest management and the sustainability of their products. The agricultural microbials market, in terms of formulation, was dominated by the liquid segment. The convenience in use, handling, and application of liquid microbial products are the major reasons that support the acceptance of these products among farmers. However, manufacturers have been developing a number of dry microbial products for crop protection, owing to which the segment is projected to grow at a higher rate in the coming years. North America is estimated to account for the largest market share in 2017, while Europe is projected to be fastest-growing in the agricultural microbials market over the next five years. Agricultural microbials are expected to be a potential substitute for synthetic pesticides in Europe, due to the growing regulations on chemical usage and maximum residue limit. The ban on the use of neonicotinoids, glyphosate, and paraquat is expected to drive the growth of the European agricultural microbials industry. The major factors restraining the growth of agricultural microbials are the shorter shelf life, field persistence, and storage conditions of microbial pesticides. Microbial solutions have a shorter shelf life of 6–24 months in comparison to conventional pesticides, which can last for 2–4 years. The global market for agricultural microbials is dominated by large players such as BASF (Germany), Bayer (Germany), Monsanto BioAg (US), BioWorks (US), DowDuPont (US), Syngenta (Switzerland), and Certis (US). Some emerging players in the global market include Marrone Bio Innovations (US), Koppert (Netherlands), Arysta LifeScience (US), Valent BioSciences (US), and Isagro (Italy).